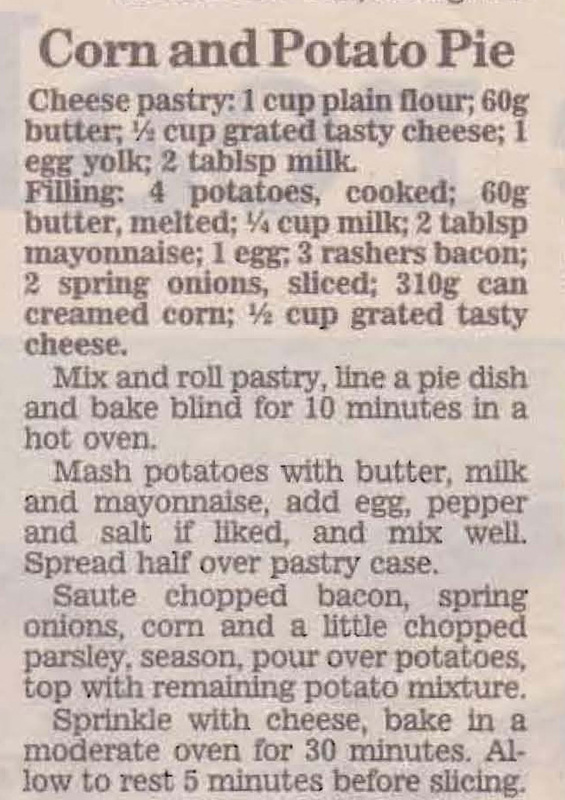 The cheesy pastry base in this recipe is filled with mashed potato, bacon, spring onions, creamed corn and more cheese, which sounds like a great combination. It doesn’t say so, but I’m assuming they mean for you to heat it hot, although cold the next day might be interesting as well. This entry was posted in All Recipes, Savoury Quiches/Pies/Patties and tagged 1980s, bacon, cheese, cheese pastry, corn and potato pie, potatoes, spring onions by bebsrecipes. Bookmark the permalink.